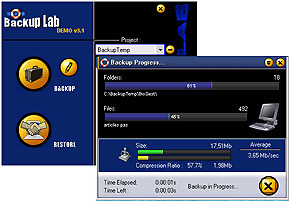 BackupLab is a state-of-the-art, easy-to-use data protection and disaster recovery program. Backup important files, your entire computer or your network. BackupLab backs up to Zip drives, mobile disks, SD, MMC, CF cards and other removable media drives and devices, and employs disc spanning and data compression, which typically can increase several times your media capacity. In the event of a hard drive crash, a system failure, or even simple human error, you can restore a single file or your whole hard drive with BackupLab. This site does not contain serial number, crack, keygen BackupLab serial number : serial number is the simplest type of crack. A serial number(cdkey,product key,etc) is register the program as you may already know. a crack or keygen may contain harmful software. If you cannot find the exact version you want, just give it a try. for more information read .nfo/.txt/.diz file include in zipped file.